Here are a few great upcoming events and PD opportunities you may be interested in. Most of them are pasted below, but there is also a flyer for a workshop attached. 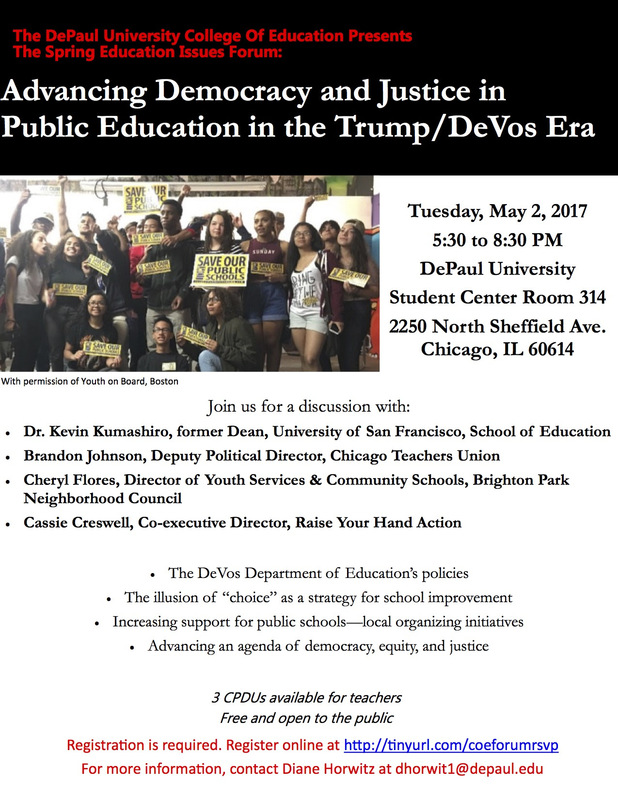 The DePaul College of Education is hosting a forum titled "Advancing Democracy and Justice in Public Education in the Trump/DeVos Era" on Tuesday, May 2nd at 5:30 pm on the Lincoln Park Campus (2250 N. Sheffield Ave, Room 314). Please see the above flyer for details. Click here to register. Young people are leading dynamic and important social change in schools and communities across the country. CFS is partnering with the University of Chicago M.Ed. in Youth Development Program to offer a multi-day training institute for youth organizers, teachers, and youth workers who are interested in exploring ideas and building strategies to incorporate social justice practices into their work. Rev Up features workshops led by some of the most innovative youth development organizations in Chicago and provides opportunities to build strong professional networks to support youth-led social change. 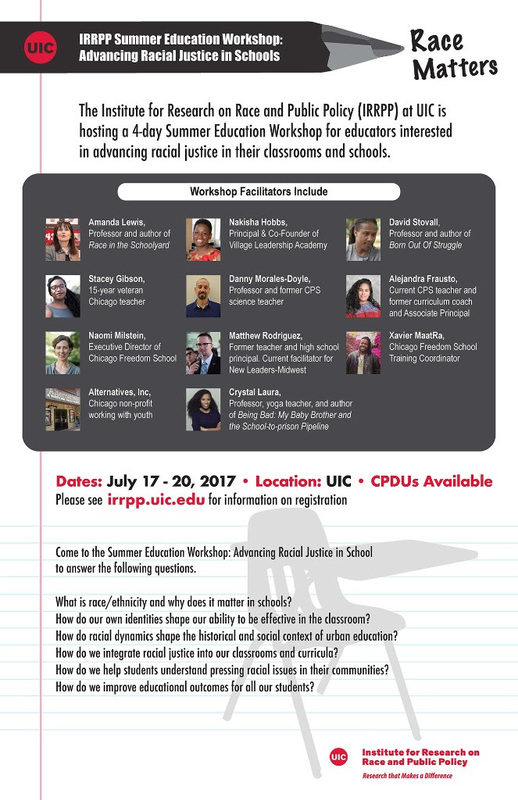 This 4-day, intensive IRRPP Workshop is intended for all K-12 educatorsinterested in advancing racial justice in their classrooms and schools. The purpose of the retreat is for participants to acquire new knowledge and skills that they can bring into their schools as well as become embedded in strong networks of support that will further institutional and community development and improve educational experiences and opportunities for underserved communities. The workshop is structured to include a competitively selected cohort of 50 participants. CPDUs available for participants. Find out more, including how to apply here. 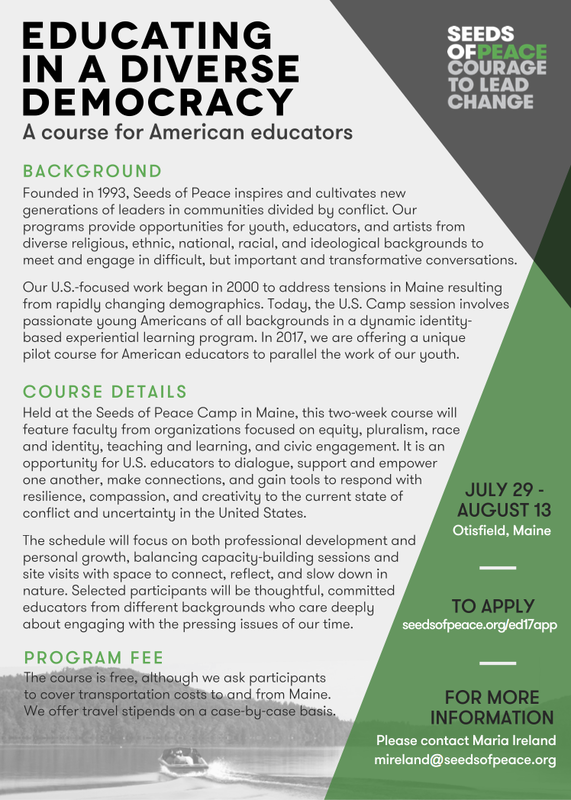 Seeds of Peace is hosting a professional development course for educators that will happen in Maine from July 29 to August 13. This is an opportunity to become a part of a supportive network of fellow educators and gain skills for compassionate and effective work with American youth in our current political climate. Please see the flyer above for more details. If you are interested in becoming a part of this innovative course, apply here. Outstanding professional development for educators. Thought-provoking community events. Find an event in the Chicago area or join us online! Scholarships are available.